Is elder care in America working, or do we need a new system to ensure better nursing home quality of care for seniors? According to a recent article in Forbes, the system as it currently stands just is not working. Indeed, the author suggests that the disproportionate attention to caution and safety results in risk aversion, which actually may diminish the quality of care that the elderly receive at nursing homes and assisted living facilities. Does Risk Aversion Result in Lower Quality of Life? Why would risk aversion result in seniors experiencing a lower quality of life? The article explains that many assisted-living facilities are particularly concerned about accusations of neglect. As a result, each time a patient complains of pain or falls, staff at the facility will call an ambulance. For example, a woman with dementia was residing in an assisted-living facility. The elderly woman had an anxiety issue about needing to use the bathroom, and often complained and became agitated when she did not have easy access to a toilet. She often fell without sustaining obvious injuries, but each time, the staff would call EMTs to take the woman to the hospital in an ambulance. When she arrived at the emergency room, she was not classified as a high priority patient. As such, she would lay on a gurney and wait to be seen. While waiting, she would experience extreme anxiety about being unable to use the bathroom. Following these unnecessary hospital visits, it would take “several days” for her to “recover her cognitive function back to its baseline” given her dementia. Should assisted-living facilities and nursing homes accept waiver liabilities for older patients who want to maintain a better quality of life while risking injury? According to the Forbes article, elder care facilities are extremely hesitant to accept waivers such as these. But should older adults maintain the right to take informed risks at the possible detriment to a facility’s reputation? According to the California Department of Public Health, nursing home residents in California do maintain specific rights. While many of the “Nursing Home Residents’ Rights” concern receiving certain treatments rather than refusing them, the language is clear for elder residents’ rights: “you have the right to accept or refuse treatment, and if you accept, you have the right to change your mind for any reason at any time.” While consent typically is implied for routine care like bathing and feeding (or is given in the admission agreement to the facility), residents should still know that they do have rights with regard to their treatment, and even their routine care, when they’re in a nursing home or assisted-living facility. Do you have questions about your elderly loved one’s rights in a nursing home or concerns about nursing home abuse? 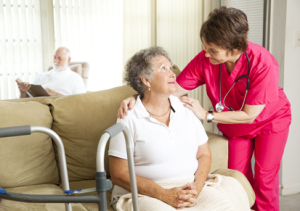 Contact an experienced San Diego nursing home abuse lawyer at the Walton Law Firm today.